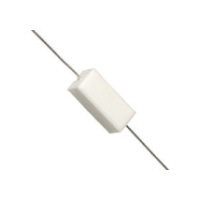 A wire wound resistor is an electrical passive component that limits current. The resistive element exists out of an insulated metallic wire that is winded around a core of non-conductive material. The wire material has a high resistivity, and is usually made of an alloy such as Nickel-chromium (Nichrome) or a copper-nickel-manganese alloy called Manganin. Common core materials include ceramic, plastic and glass. Wire wound resistors are the oldest type of resistors that are still manufactured today. They can be produced very accurate, and have excellent properties for low resistance values and high power ratings.